Goodyear Autocare, Brakes Slacks Creek, provide a wide range of breaking and automotive services to Slacks Creek and the surrounding area, including braking services, tyre replacement, wheel alignment, suspension and steering. Goodyear Autocare, Brakes Slacks Creek, have over 18 years experience working with brakes and servicing clients within the Slacks Creek area. From braking to mechanical repairs, Goodyear Autocare has the expertise to assist you with all your braking requirements. At Goodyear Autocare, Brakes Slacks Creek, our focus is delivering a high quality service at a competitive price to all our clients, and no job is too big or small. If you are looking for a professional and reliable brake service at an affordable price, give Goodyear Autocare - Brakes Slacks Creek a call today. 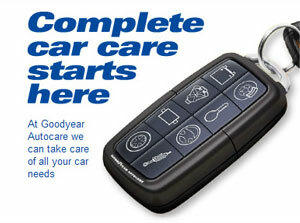 At Goodyear Autocare we can take care of all your vehicles braking requirements. The brake system is responsible for reducing the speed of a vehicle, stopping, preventing over-acceleration when driving downhill and keeping the vehicle stationary when still or parked. It is important to maintain your braking system and have your brakes regularly inspected, cleaned and adjusted. Failing to maintain your braking system can cause poor brake performance as well as increased maintenance costs caused by unnecessary worn components. Call 13 23 43 today to speak to your local Goodyear Autocare who can inspect, repair or replace all your vehicles steering and suspension components ensuring that all day, every day "we'll keep you running"